A Christian mass on a Sunday morning is nothing extraordinary in the Christian communities of Istanbul, be they Greek, Armenian, Catholic or Protestant rite. However, in Anatolia – which was virtually purged of Christians in 1924 when the Greek Orthodox population was deported to Greece in what was euphemistically called a “population exchange” with Muslims from Greece, who were forced to move to Turkey – this mass was something rare and exceptional. The Armenians had already been exterminated and deported from their Anatolian homeland in 1915-1916. That was also the last time that the Holy Cross Church on the island of Akhtamar in Turkey’s biggest lake near Van was used. 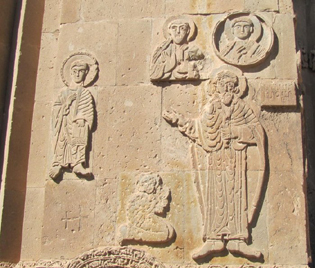 The church was plundered, the remaining monks and priests were killed and the church fell into ruins like most of the churches in Anatolia, if they were not completely destroyed. However, things change. And Turkey’s approach towards its minorities and the slow and cautious coming to terms with the past, are part of this change. 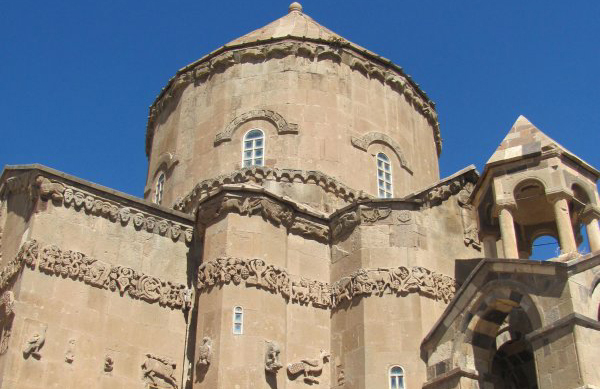 This process led to the decision in 2005 to renovate the church on Akhtamar island using state money and the participation of Armenian architects, so that the church could be inaugurated as a museum in the spring of 2007. As a museum, the church does not have a cross or a bell, nor was it foreseen that mass would be celebrated there. For 3TL (ca. 1.5 Euros) it is possible to visit the church-museum, which is the property of the state, not the Armenian community. But when the government announced in 2009 that mass could be celebrated there once a year, the Armenian patriarchate in Istanbul applied and the governorship of Van approved. Initially, 12 September was chosen as the date, but because this coincided with the referendum on constitutional changes, the 19 September was chosen for the historic event. 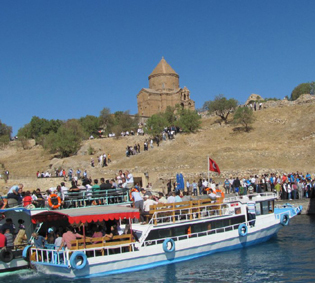 And so, after 95 years, Armenians set off from the village of Gevas by boat to celebrate mass in the Holy Cross Church. However, the holy cross was only next to the entrance on a podium – it soon became clear that there was no cross on top of the church. As a result, the Armenian bishops from Echmiadzin, the spiritual centre of Armenia, and Jerusalem cancelled their participation, as did some Armenians from abroad. No cross, no bell, but modern technology makes everything possible! At 11am, the church-bell was heard from a recording via loudspeakers. Since the church only fits 55 visitors, the rest followed the mass on two screens outside the church. Even if some official numbers speak of around 5,000 followers, there were probably not even half that number and of course, there were many non-Christian and non-Armenian visitors too. The cross controversy was not the only issue with officialdom. The Turkish side insists on calling the island Akdamar, which means white vein in Turkish. The original name has nothing to do with either white or vein, but refers to a tragic love story between the girl Tamar and her Armenian (or according to some other sources Kurdish) secret boy-friend who lived on the coast facing the island. When the father of Tamar found out that the two youngsters had been meeting secretly, he organized a trap for the boy who just managed to escape. However he was too weak to swim across the lake and reach the coast alive, his last words being “Ah Tamar”. Days before the event, the press was full of reports about how much effort was put into renovating and modernizing facilities in preparation for this big day for the local economy. Hopefully this is untrue, because the facilities were not adequate at all, given the number of visitors, which was significantly fewer than expected. This is partly understandable because of the inexperience of the organizers, but at the same time it is difficult to understand, because Van does not exist in a vacuum and other cities in Turkey have already organized events like this. The next mass is scheduled for May 2011 and it is to be hoped that by then there will be more than tea and water available on the island and perhaps even water in the bathrooms! The rapprochement between Turkey and Armenia in Van on 19 September did not end with the mass, which lasted three hours. In the evening in the sport’s hall in Van, the Istanbul- based Armenian Vartanants Choir gave a concert, followed by a performance of the folklore group Maral from the Armenian Esayan highschool in Istanbul. This event was followed, like the mass, by the Mayor Kaya of Van, the Van governor Karalo?lu, mayors of smaller surrounding cities and the church hierarchy. Aram Atesyan, who led the mass, donated 10,000 TL (ca. 5,000 Euros), raised by selling candles at the church, to the Van governorate for cultural activities. The folklore group, which expressed all the similarities between Armenian, Kurdish and Turkish music and dance, was particularly well-received by the audience. However, both the choir and the folklore group went on way too long for such an event: the author left at midnight after four hours, but those in the protocol area were not lucky enough to be able to leave before the end. The Akhtamar mass was not the only taboo broken relating to religious freedom this summer. On 15 August there was a mass for the first time in 88 years in the Sümela monastery near Trabzon at the Black Sea, which was led by Greek Orthodox patriarch Bartholomew, and just before the mass on Akhtamar there was (similarly, after many decades) a Friday prayer in the mosque inside Van castle. All these steps taken singly are small, but taken together they indicate a change of mentality on the part of the Turkish state, which no longer seems to perceive religious activities as a threat, especially not these performed by non-Muslims, but rather as the norm in a democratic secular state. Religious freedom, including the freedom from religion is, and has to be, at the basis of every democratic state and EU member or candidate. Turkey is not there yet, but it is closer than ever.